Over the last few months, I’ve been helping to develop the group’s understanding of civic activism by US political groups on the right – conservatives and libertarians, broadly speaking. We’ve been particularly looking for examples which centre on encouraging youth movements through grassroots participatory practices and new media platforms. Of course, the most high-profile example of participatory politics identified with the American right today is the Tea Party phenomenon, which was hailed as potentially being decisive in the 2010 midterm elections (although the actual results were mixed). 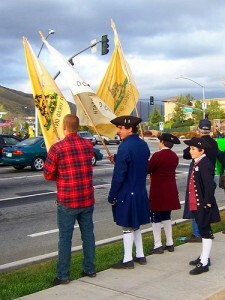 The Tea Party movement is actually neither a political party nor a unified movement although the numerous groups which compose it have a generally recognized shared agenda that supports smaller government and a reassertion of what is claimed to be the original or traditional values of the U.S. Constitution in American politics. 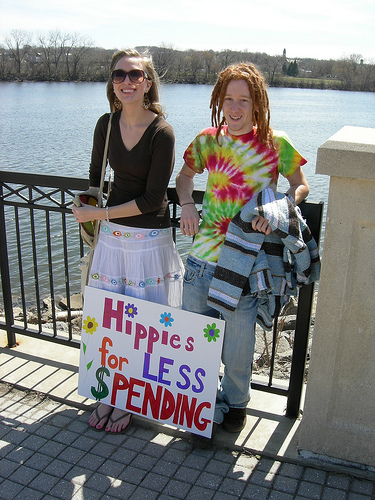 Typically understood as first being catalyzed by the government response to the financial crisis of 2008 as well as opposition to proposed healthcare reform legislation, the Tea Party movement can be roughly characterized as being focused on economic and political libertarianism, with relatively little interest in the social issues that conservatives often prioritize. A card-carrying veteran libertarian might question the ideological consistency of Tea Party politics, however — seeing them as more culturally than philosophically driven. While it has formed itself out of many different and distinct clusters from across the country, the movement is generally understood as favouring relatively leaderless, non-hierarchical and decentralized structures and processes of organization and communication. For example, as the National Journal has reported, a popular management book that is widely read by organizers within the Tea Party movement is The Starfish and the Spider by Ori Brafman and Rod Beckstrom (2006) which describes and contrasts the advantages and drawbacks of two ideal type models of organizations – the centralized, tightly controlled and hierarchical spider model and the dispersed, loosely networked and egalitarian starfish model. Many Tea Party members would consider their movement to be more like a starfish while more traditional political party structures are thought to to be more spider-like. The starfish model however would not have been so successful were it not for the crucial role played by new media platforms, and especially Web 2.0 social media – Tea Party organizations have prominently encouraged social media training for its supporters. Of course, the Tea Party is also known for being controversial, with heightened political tensions on all sides. The movement has attracted much critical attention from those on the political left and centre — including accusations that the the movement is largely (consciously or not) motivated by the divisive politics of race and alarmism — although many critics seem to be still working through the process of making sense of the complexities of the Tea Party movement for themselves. There have also been prominent liberal commentators who have expressed partial or selective support for some Tea Party positions and initiatives, including the feminist Naomi Wolf and the cyberspace legal theorist Lawrence Lessig. There are critics of the Tea Party on the right too — for instance, conservative commentator Ron Radosh has concurred with liberal Harvard historian Jill Lepore’s objections to the Tea Party’s understanding and use of the history of the American Revolution and the Founding Fathers. And while Republican Party representatives and politicians have increasingly and often successfully sought to work with Tea Party activists, there are tensions between the Republicans and the Tea Party movement and some gaps in mutual understanding. Alliances between the two are still fraught with debates over whether the traditional GOP establishment is co-opting a movement that prides itself on its grassroots origins and a philosophy of principle over party. Views amongst Tea Partiers are also decidedly mixed about those right-wing political celebrities who seem to be claiming a role in the movement: while there is significant skepticism about probable contender for the 2012 Republican Presidential nomination Sarah Palin, there is seems to be greater support amongst Tea Party activists for the Fox News television personality Glenn Beck. The evolution of grassroots identity. The Tea Party movement famously understands itself as fiercely proud of its amateur grassroots identity and origins – it is widely recognized as one of the most successful popular political movements in America in recent decades. Anecdotes of movement supporters becoming interested in politics for the first time in their lives are a staple of coverage of the movement. However, as the movement has matured, a substantial amount of the grassroots political activity originally sparked seems to have faltered or has turned out to have been limited in its engagement in political processes — as highlighted by a recent Washington Post investigation. At the same time, the GOP and the well-funded and long-established networks of think-tanks and professional political activism organizations on the right seem to be playing an ever greater role in the movement despite the anxieties of many Tea Party organizers who are protective of the movements’ grassroots identity. What can the experiences of the Tea Party movement tell us about the evolution of the meaning of “grassroots” in the life cycle of a popular political movement? The curious lack of young Tea Party activists. As Meghan McCain has complained, the Tea Party seems to have struggled to attract and retain young activists. 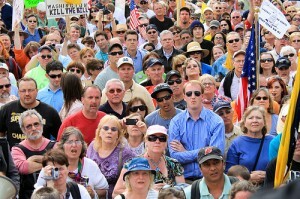 While it is true that the demographics of the Tea Party movement seem to closely track those of the general U.S. population, it is striking to compare it with the “Obama-mania” of 2007-8 as well as with Republican Senator Ron Paul’s “Re-LOVE-ution” libertarian “insurgency” in the same period. Both those movements were seen as grassroots successes (albeit with support from traditional political structures) with strong internet and new media components – and both were understood largely driven by younger participants. This was especially so in the case of Ron Paul’s campaign which is curious given that many of his positions (and those of his son, Republican Senator-elect Rand Paul) are roughly sympathetic with those espoused by Tea Party movement supporters. What can the Tea Party case tell us about youth participation on the right in America? Grassroots youth interest in libertarian groups appears to be strong so why has the Tea Party not (so far) attracted more young voters and activists? This entry was posted by zli on Tuesday, November 30th, 2010 at 2:35 pm and is filed under Uncategorized. You can follow any responses to this entry through the RSS 2.0 feed. Both comments and pings are currently closed.